Scotland’s most southerly point, the foghorn at the Mull of Galloway Lighthouse, Carrickcarlin Point, Dumfries and Galloway, Scotland. Fingerpost at the Mull of Galloway, Scotland’s most southerly point, Dumfries and Galloway, Scotland. The Mull of Galloway cliffs I, Dumfries and Galloway, Scotland. The Mull of Galloway Lighthouse, Dumfries and Galloway, Scotland. Foghorn at the Mull of Galloway Lighthouse, Carrickcarlin Point, Dumfries and Galloway, Scotland. Lythe Head, The Mull of Galloway, Dumfries and Galloway, Scotland. Undulating landscape, The Mull of Galloway, Dumfries and Galloway, Scotland. The Mull of Galloway cliffs II, Dumfries and Galloway, Scotland. The Rhins landscape I, Dumfries and Galloway, Scotland. The Rhins landscape II, Dumfries and Galloway, Scotland. Bales, The Rhins, Dumfries and Galloway, Scotland. Waves and ripples, The Rhins, Dumfries and Galloway, Scotland. The Mull of Galloway Lighthouse from Carrickgill, Dumfries and Galloway, Scotland. The Rhins landscape III, Dumfries and Galloway, Scotland. The Rhins landscape IV, Dumfries and Galloway, Scotland. Hughes of Knockencule Farm on the way to feed his cows. There are a handful of derelict crofts on his land that once housed seven people that used to work with him. Today he manages the farm mostly alone “All the young ones leave after school now”. The Rhins, Dumfries and Galloway, Scotland. Derelict croft, Knockencule Farm, Dumfries and Galloway, Scotland. Castle Clanyard, the remains of a medieval tower-house, the Rhins, Dumfries and Galloway, Scotland. Good weather at last! The Mull of Galloway Lighthouse. Numerous barbed wire fence crossings were required today. This gets old fast when you’re taking the pack on and off all the time and attaching the canvas barb cover. Electric fences everywhere, tricky to cross unless they can be pushed down sufficiently far to step over with a trekking pole. The ‘Core paths” are a joke here. ‘Be ye man, Be ye wumman’ Track to Port Logan, Dumfries and Galloway, Scotland. This was a double dinner day! Camp, Cairnie Finnart near Port Logan, Dumfries and Galloway, Scotland. Glad to see the weather has improved. This is a stunning stretch of coastline, I’m looking forward to walking it. I knew this part of Scotland was far south but I hadn’t realised it was as close to Belfast as that. It is also further south than I realised it seems to line up more or less with Hartlepool on the east coast of England, not far north of Yorkshire. Funny to think you can be in Scotland yet so far south. I’ve really enjoyed some sun! Yes, it’s unexpected that you can see all those countries from the Mull of Galloway. The Rhins is exceptionally beautiful as I hope my pictures convey but there are many obstacles to walking as soon as you leave the Mull of Galloway itself, so expect to use a lot of roads if you want to go any distance. A beautiful stretch of coast that I was not aware existed so far south. Thank you for showing us. You were certainly fortunate with the weather today. Duck tape did the trick on the troosers! LOVE the portrait – I sthat not your first on this blog? Thanks for showing people our home range – a place where history is so touchable. Long way North now! Thank you! Yes it is the first. I thought he is so heroic at eighty years to be managing the farm alone when he once had the help of seven. Loved looking at these photos. There is a strong sense of place. You can only imagine what winter conditions at the abandoned croft might have been like! There is a fascinating Victorian fishpond at Port Logan. Hope you may have encountered it. Absolutely. Sadly I missed that as I walked through port Logan in the dark, is that under the high tide line? Can’t paste a link. It was originally a blowhole that was enlarged by dynamite and the water was refreshed at high tide. It was kept stocked with fish for the local Laird. Now I think there is a valve. It was being used to raise young fish eg plaice when I visited some time ago. Googling Port Logan Fishpond finds it. Thanks for drone link. Interesting geology. Looks as though there may be a second smaller “pond” nearby. The photos have a real special quality on this blog,particularly love the the photo of the crofter. Real shame about the state of the paths -is this the fault of the local authorities or landowners? Thank very much. The Scottish core paths seem in a generally poorer state than the English public footpaths but then there is the right to roam to compensate. However, this doesn’t help much in lowland agricultural areas as barbed wire, dry stone walls and electric fences are hard to climb and many fields contain cattle. I don’t know how the funding to maintain the core paths is distributed so I can’t comment on who is at fault for the obstacles and lack of maintenance. My experience of west of Scotland paths is that they are patchy. Perhaps the low population density explains why they get less attention from the local council. I imagine that must be the case. 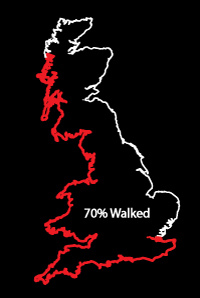 The long-distance paths like the Mull of Galloway Trail were better maintained.